Offer clients a timeless elegant look. 1. 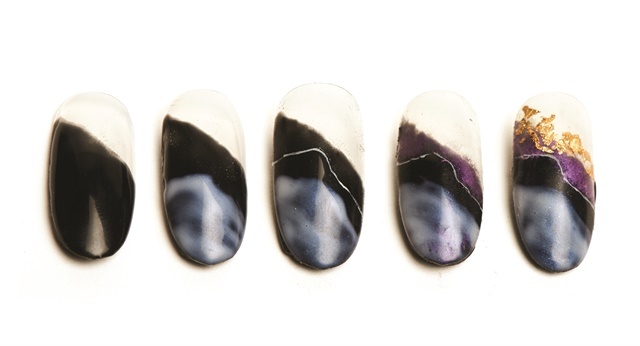 Apply two coats of OPI Black Onyx gel-polish to the bottom two thirds of the nail in a diagonal line. Make the edge fade slightly. 2. Apply one coat of OPI Funny Bunny across the bottom third on top of the black gel-polish. Make the coverage relatively uneven for a stone-look. 3. With a thin art liner, paint a thin line on the remaining black polish above the Funny Bunny layer. 4. Apply purple pigment powder above the thin white line. 5. Apply one base coat for an adhesion layer. Apply gold flakes to the top edge of the purple pigment. Apply a top coat to smooth the surface and hold the gold flakes.